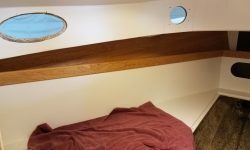 Continuing in the forward cabin, I turned to the narrow shelf surrounding the v-berth, which required a fiddle. 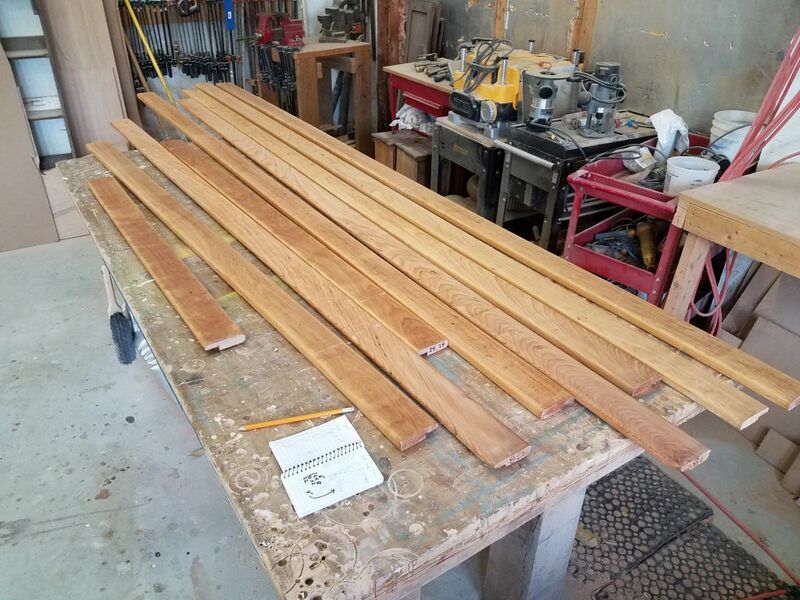 Laying out the several pieces of fiddle trim stock I’d milled and seal-coated with varnish earlier, I selected the appropriate pieces for the job. 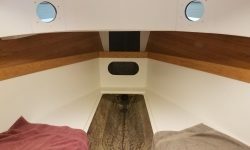 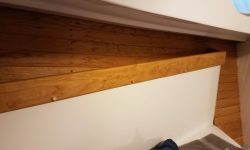 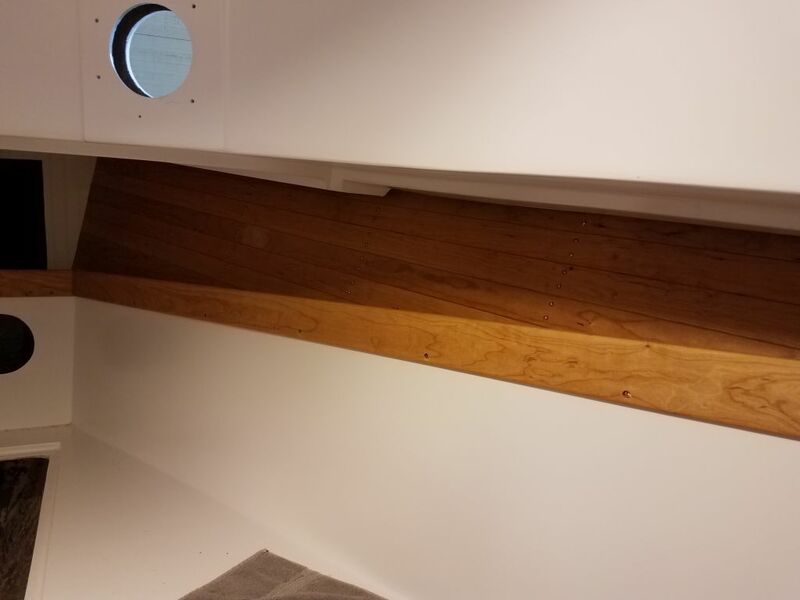 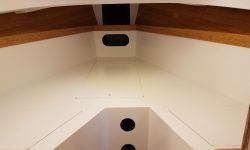 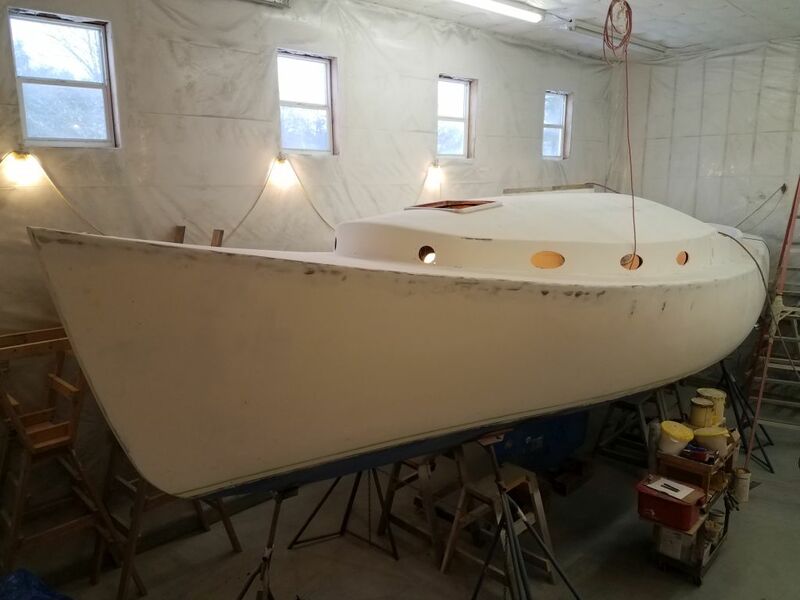 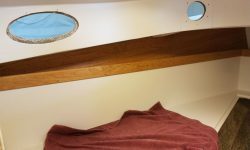 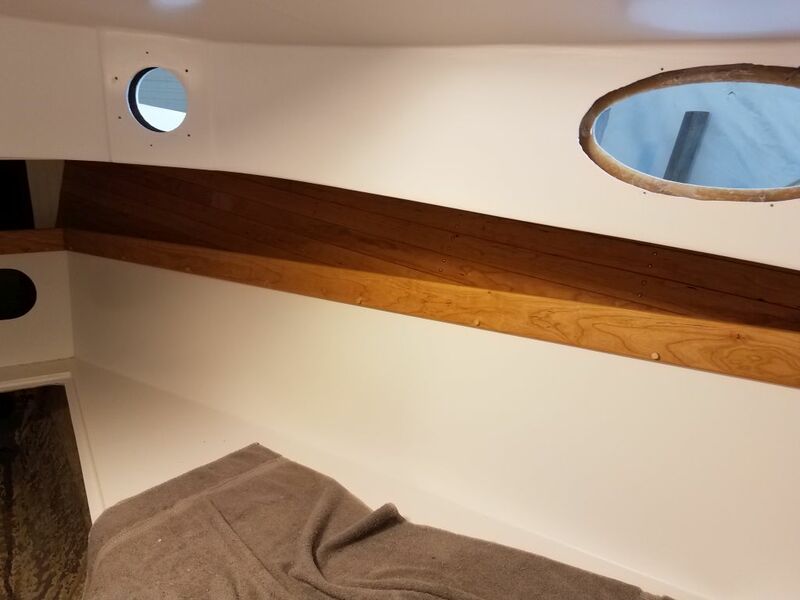 I’d previously chosen the milled trim for its intended location in the boat based on available lengths of clear, usable wood (i.e. 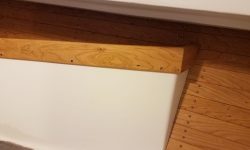 no knows or sapwood), and in this highly theoretical ideal I’d milled enough trim, supposedly, for all the berth, shelf, and countertop fiddles, but now, judging the appearances after a coat of varnish, I could see that one of the boards I’d milled had some weird grain that I didn’t like much, so I sacrificed that board to become the short forward center piece in the v-berth (out of the clear section in the middle of the board, and used the remainder as templates to help me work through the angles required for these and other trims. 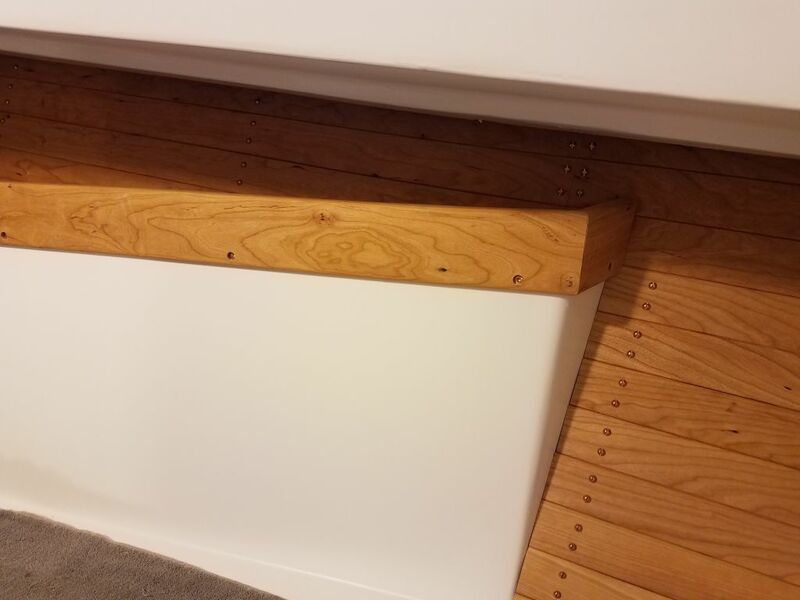 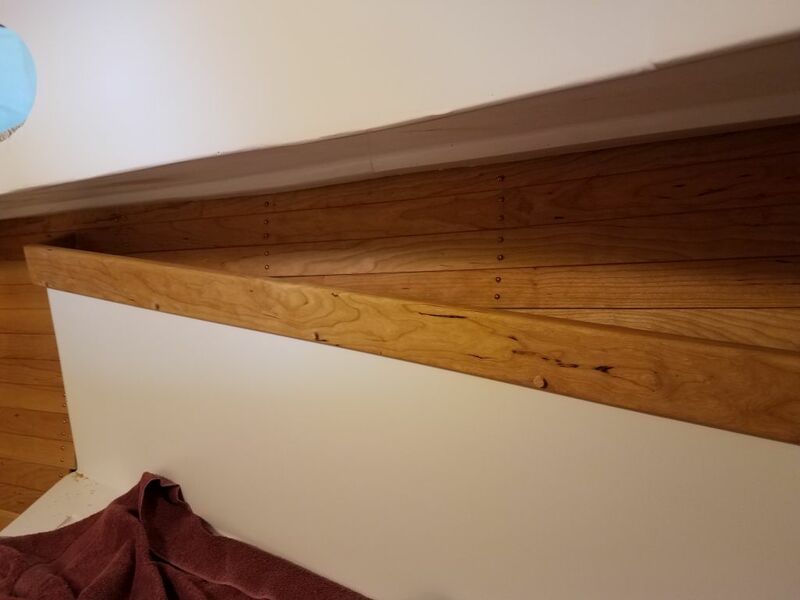 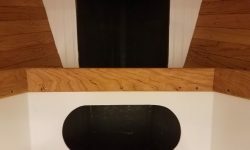 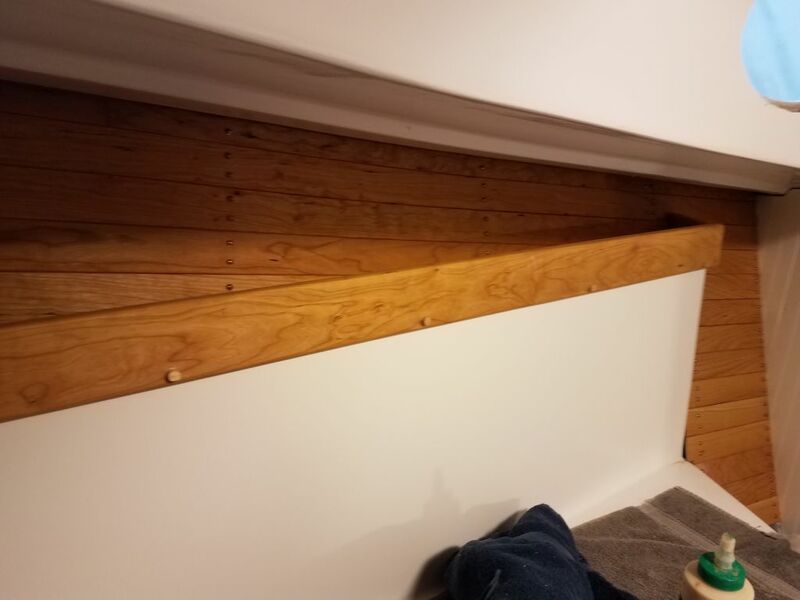 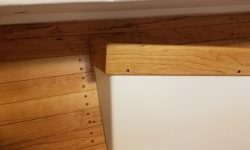 After some measuring and test-cuts to determine the proper length and miter angles at the ends, I installed the first piece of trim at the forward end of the shelf. 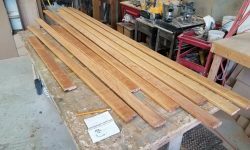 From here, it was a relatively simple matter of just time to cut and fit the two long side fiddles, which had to meet the forward center piece at the corner and also a short length of fiddle at the after ends. 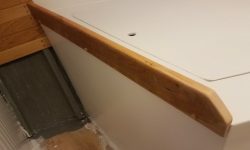 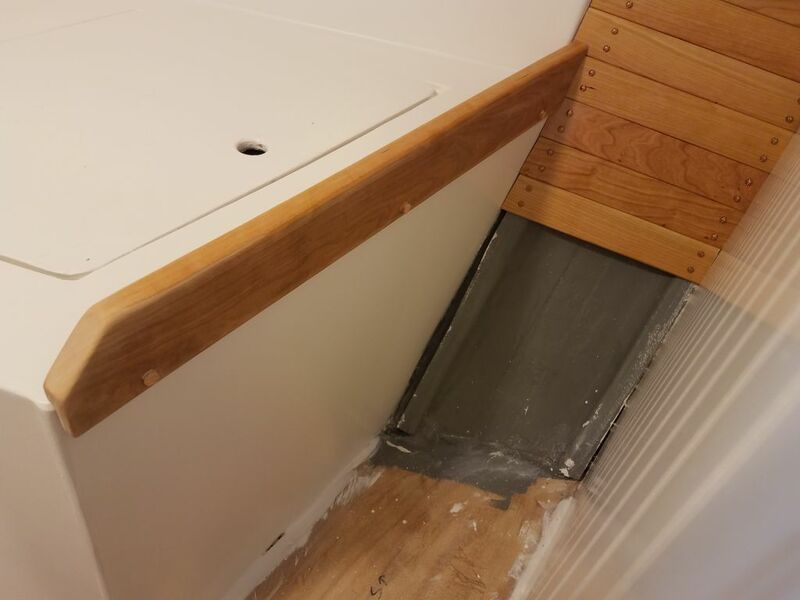 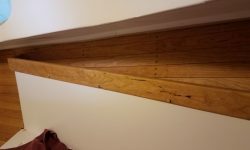 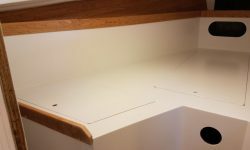 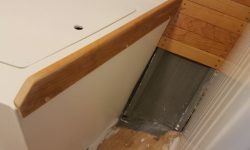 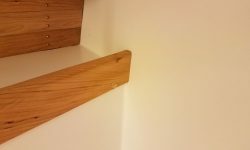 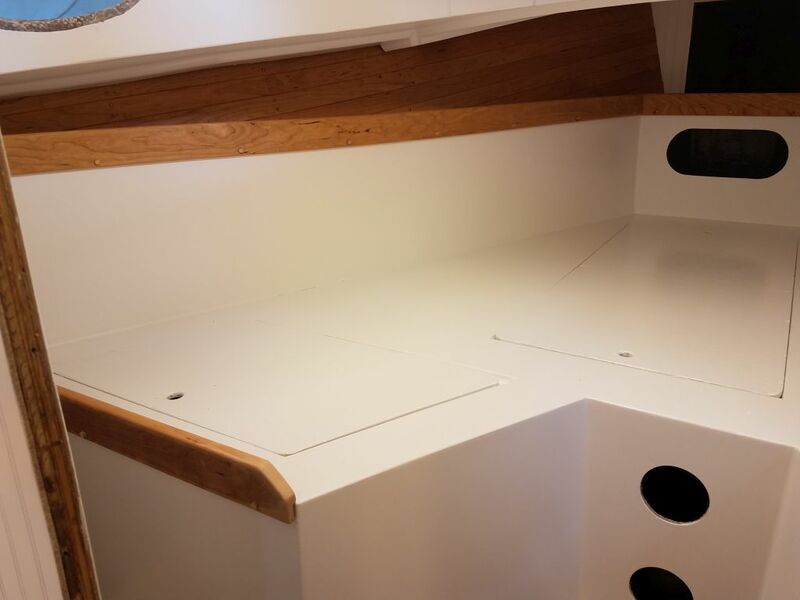 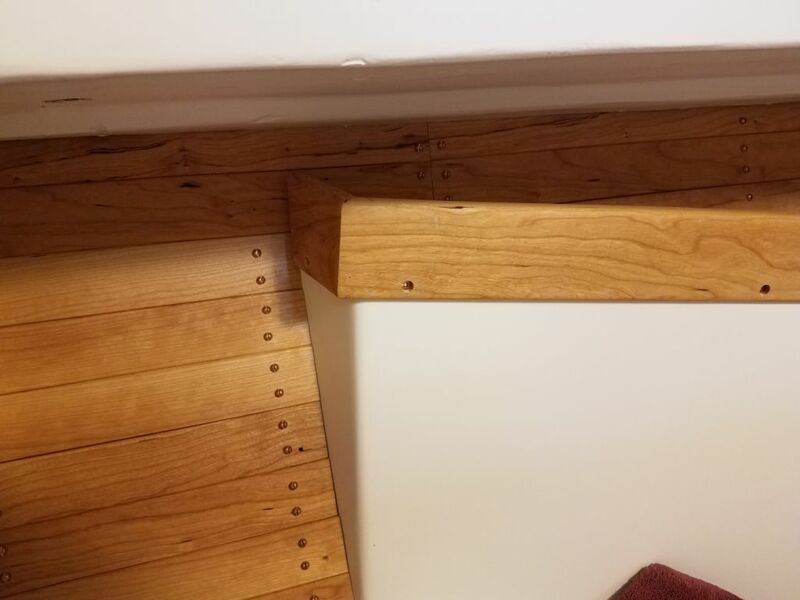 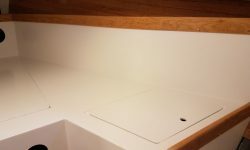 This required numerous trips up and down to cut the boards to, eventually, their final lengths to satisfy the installation requirements on each side. 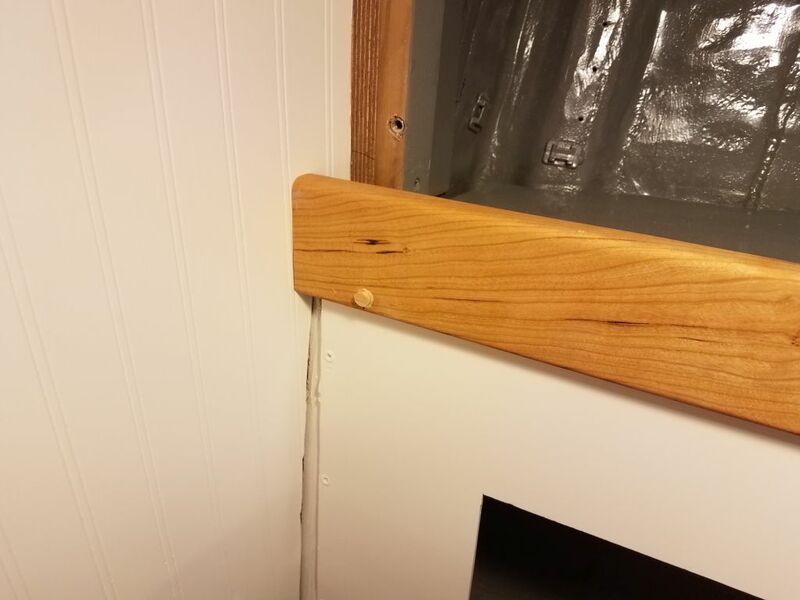 I secured the trim with bronze screws in recessed holes to accept plugs. 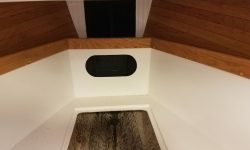 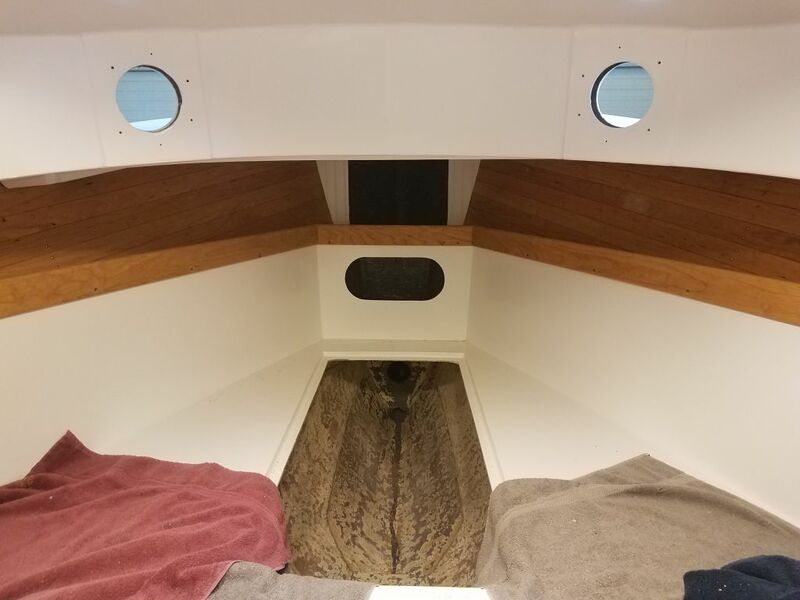 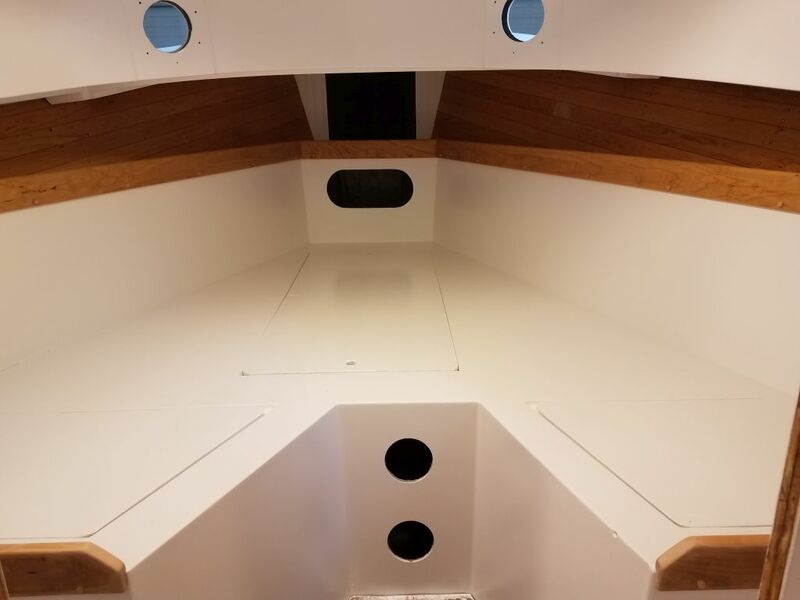 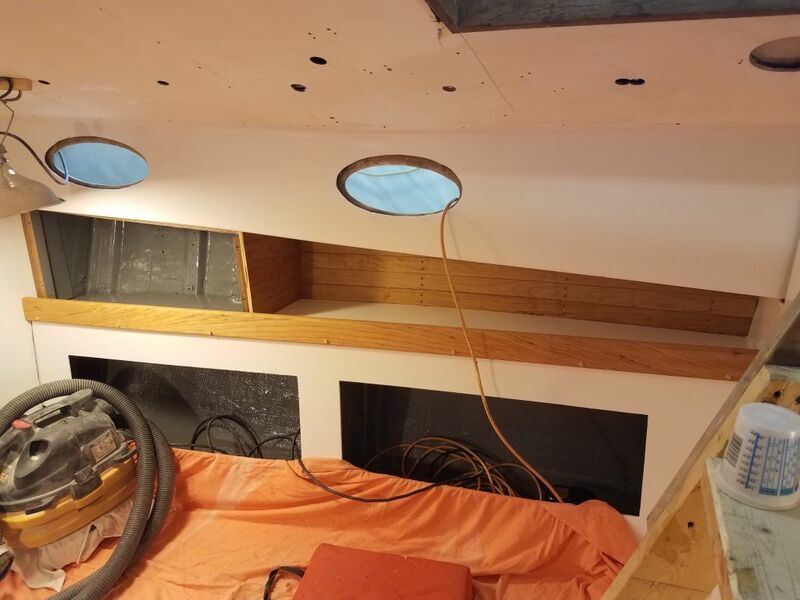 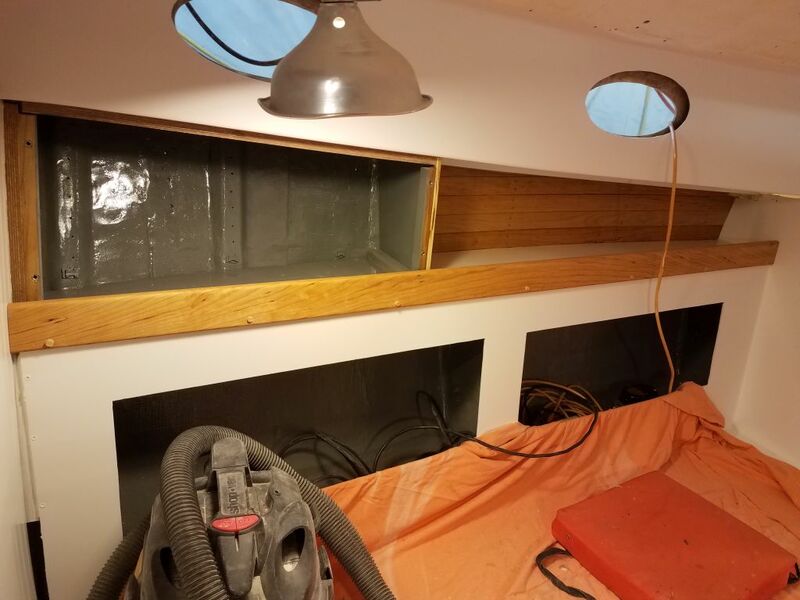 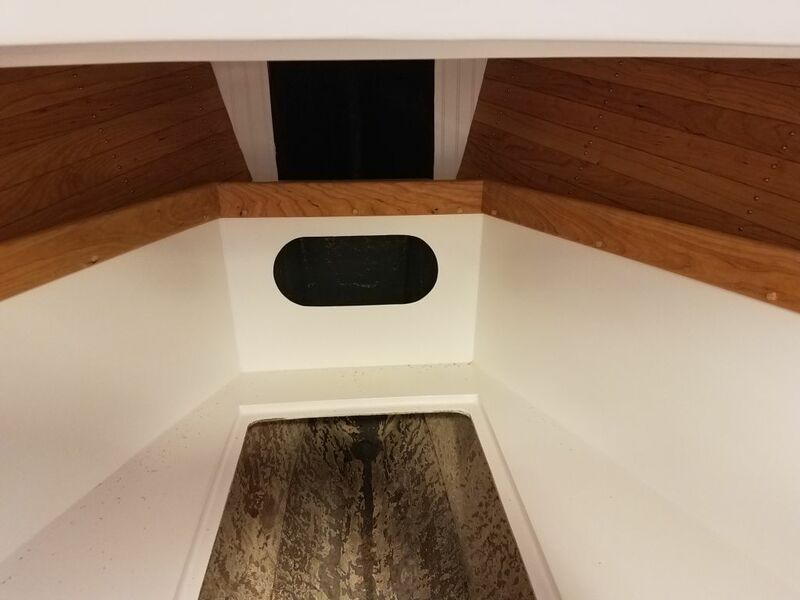 I cut the short fiddles at the after ends to match the angle of the hull, but held the trim back enough from the ceiling boards so that one could remove the short pieces of ceiling to access the chainplates as needed. 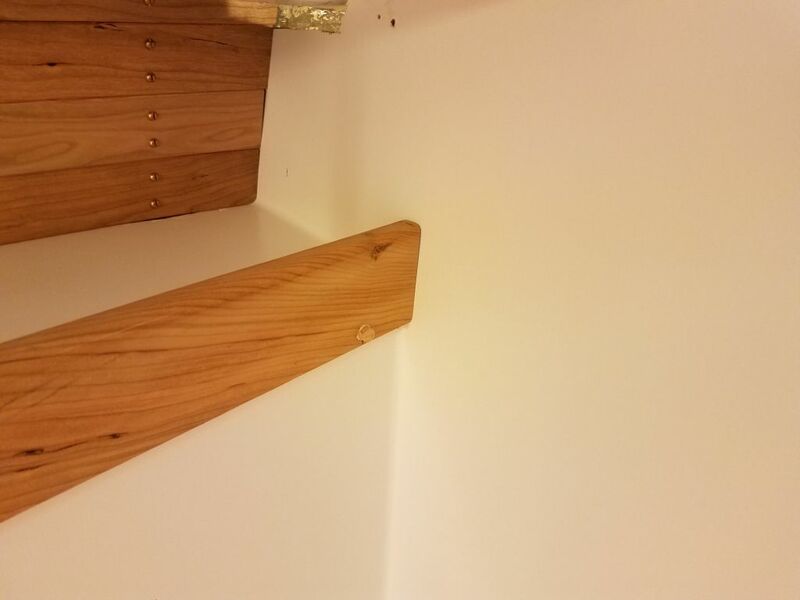 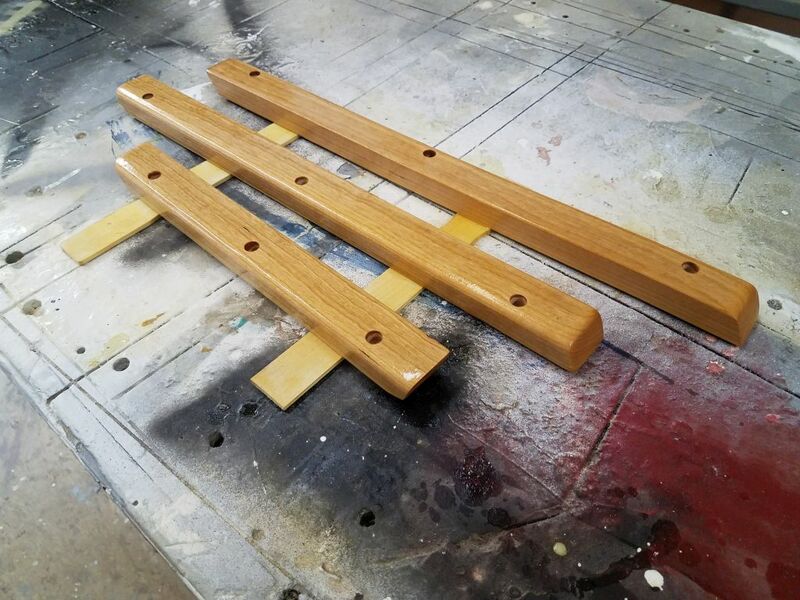 With the shelf fiddle complete, I bunged the screw holes with cherry bungs. 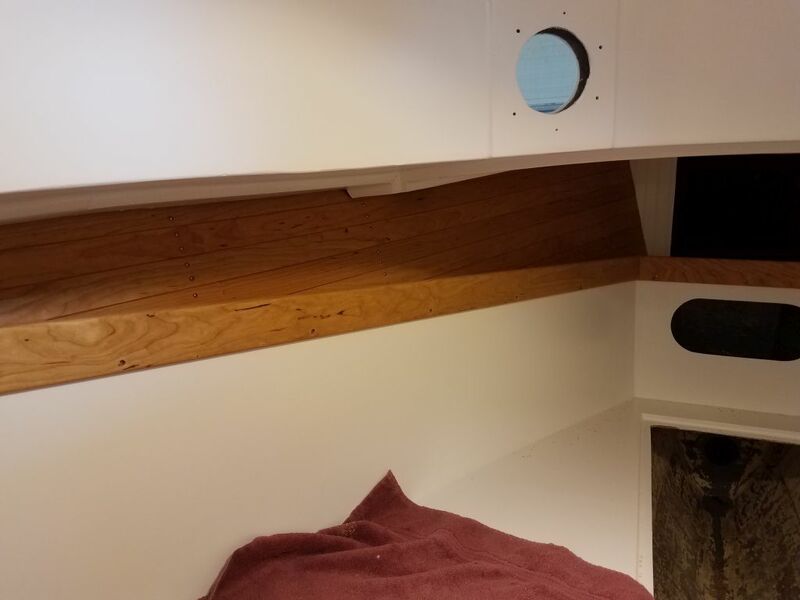 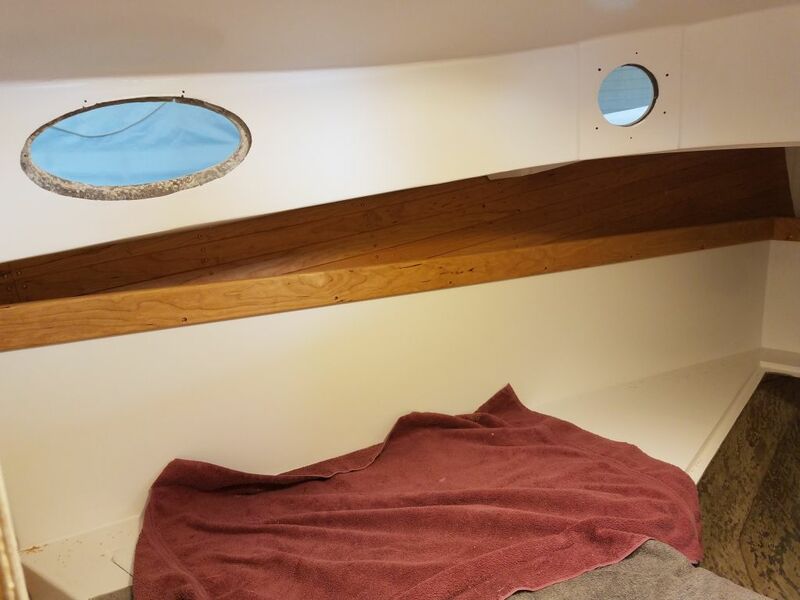 The exposed aft ends of the berth required fiddles to hold the eventual cushions in place, and I cut and installed these next. 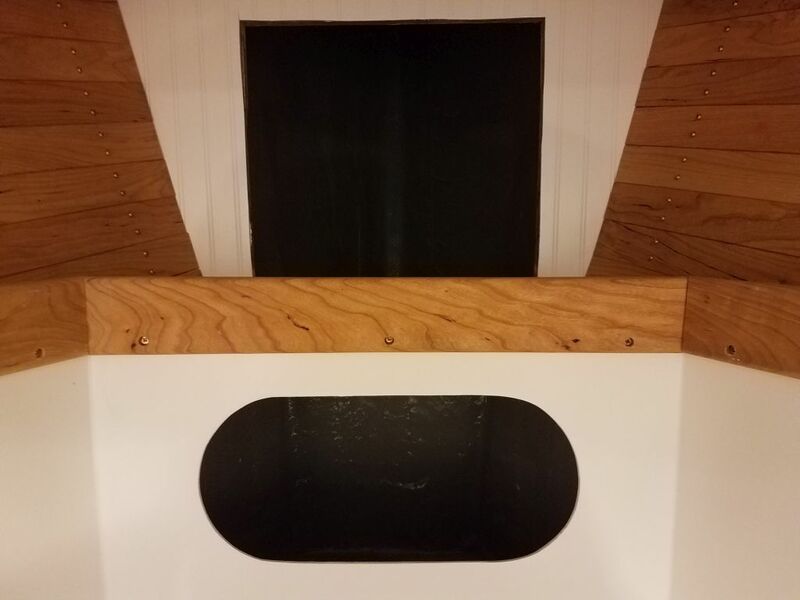 In the center of the V (not actually the center, come to that), there’d be a removable filler piece, and to support this small panel I used some offcut 1-1/2″ wide cherry stock to prepare the cleats required. 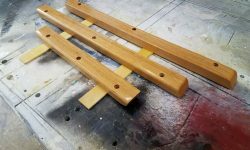 I cut, fit, and performed the basic milling at this point, but since the stock was unsanded and as-yet unfinished, I only completed a temporary installation before removing the trim and sanding and seal-varnishing it accordingly. 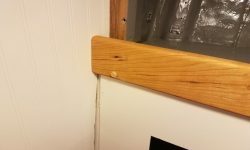 I’d install these next time and, like all the other trim, the final finishing would occur in place. 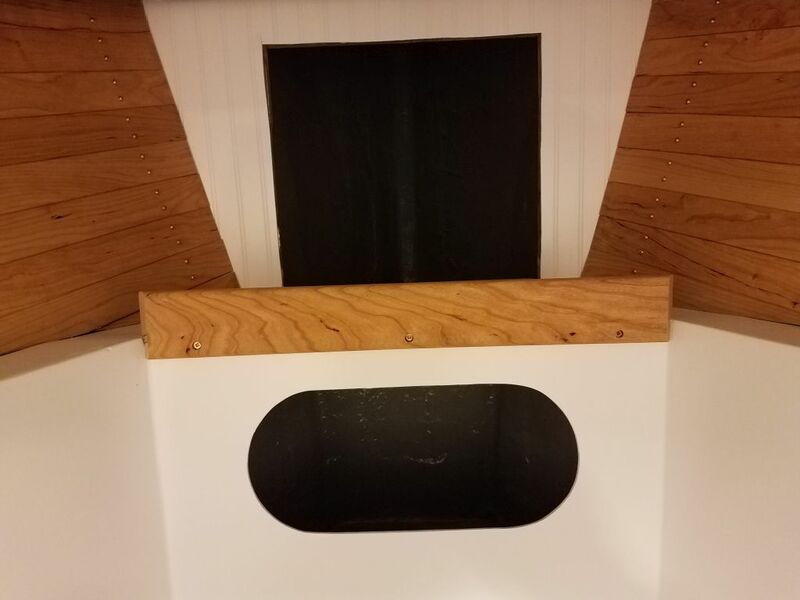 The old plywood filler piece that had been here originally was too small in all dimensions (because of the way the original trim had worked with it), but it looked like I had juuuuust barely enough of the 18mm plywood leftover from the cabin sole substrate to make a new piece. 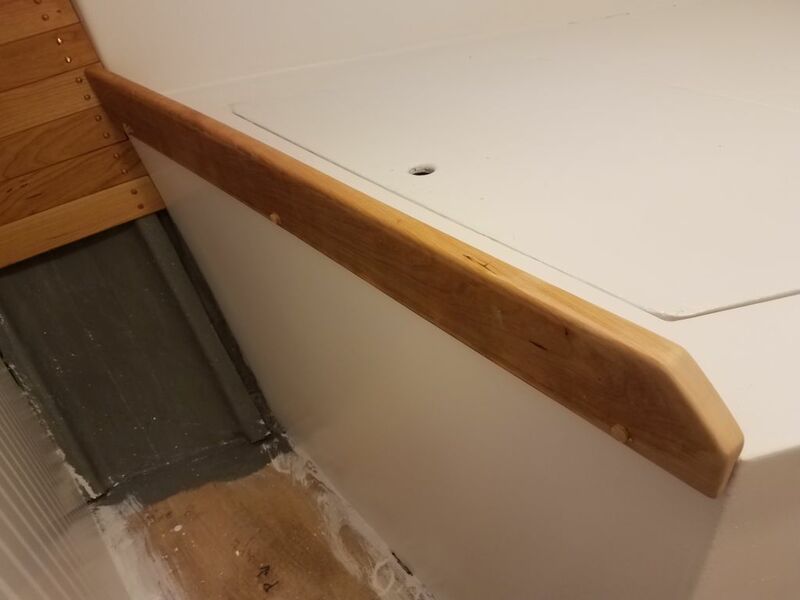 I’d template and cut the new piece once the cleats were in place permanently. 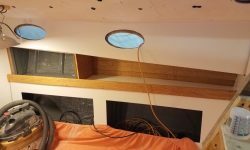 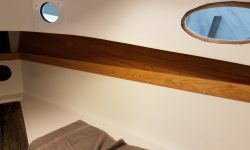 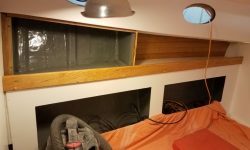 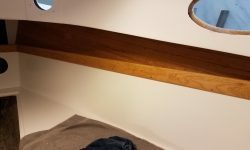 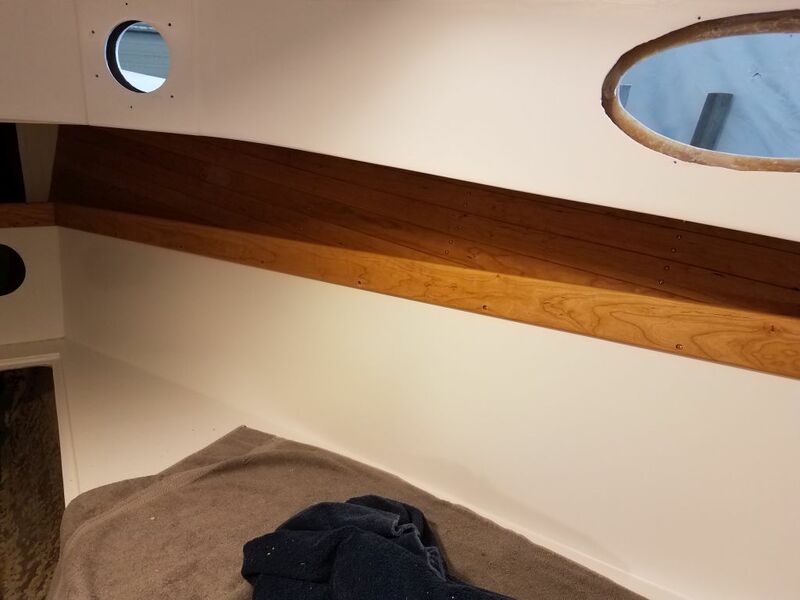 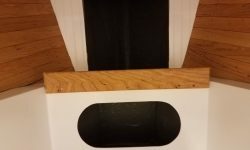 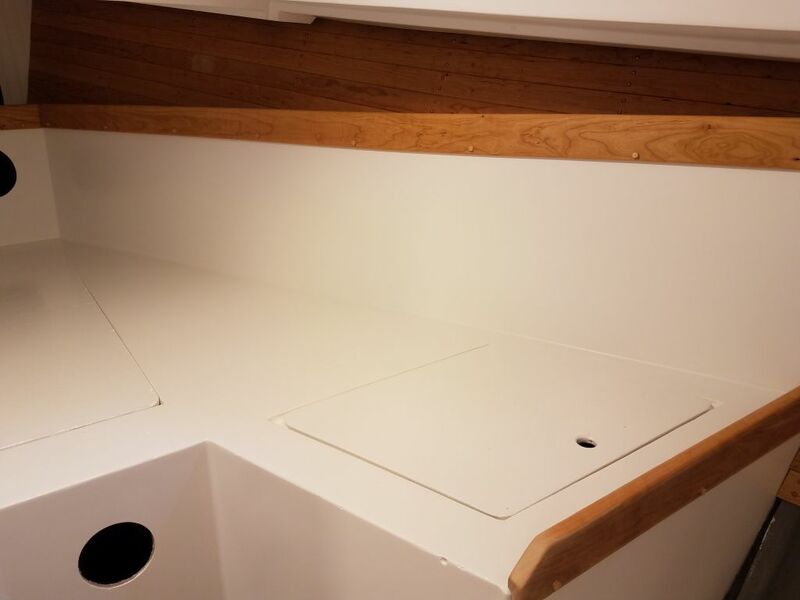 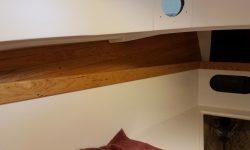 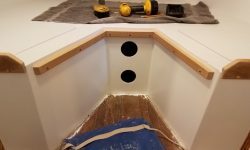 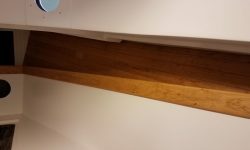 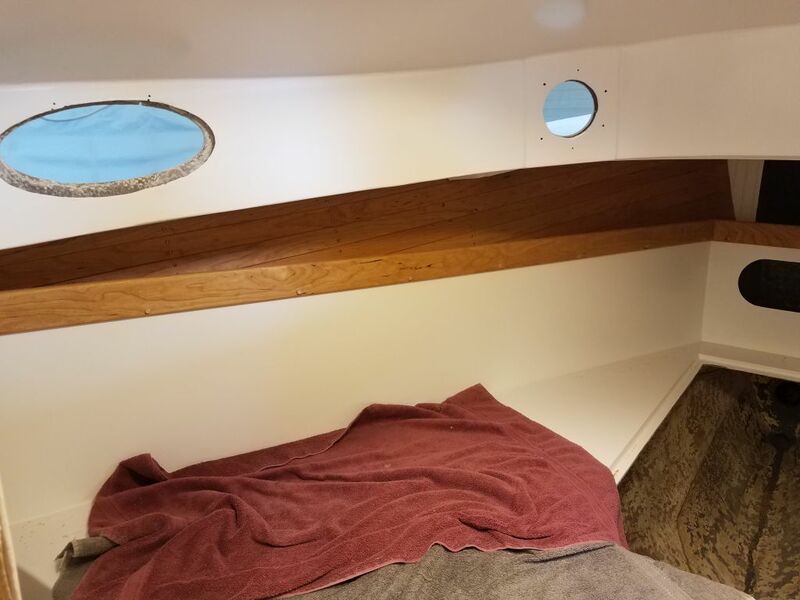 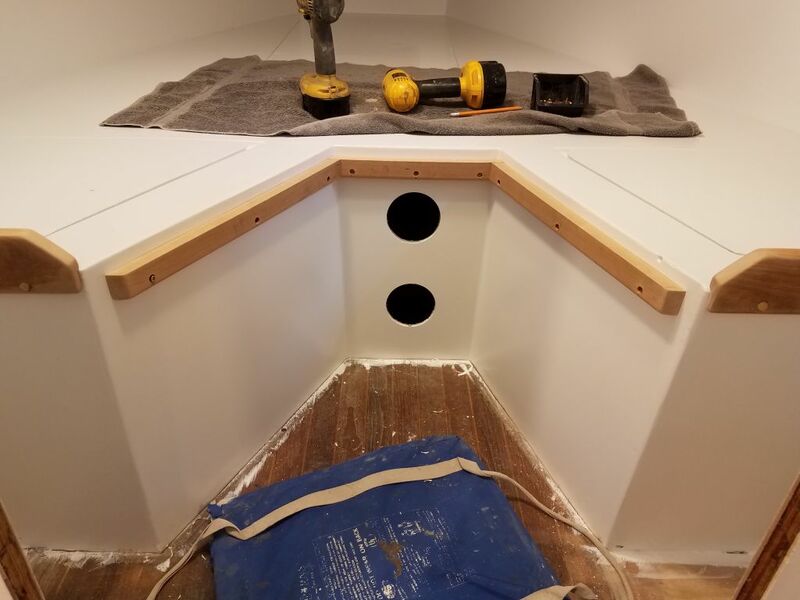 Now fairly late in the day, I had enough time to measure, cut, and install the starboard shelf fiddle in the main cabin, running full-length at the top of the backrest.